Need a little more capacity than a 3-row bleacher? Our exclusive line of 4 row bleachers are a great solution for all your events big and small. 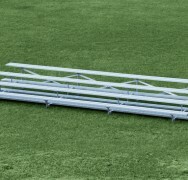 Manufactured in the USA to satisfy building code requirements, these 4-row bleachers are 2012 IBC Compliant. An ideal solution for either indoor, outdoor, or commercial use, we manufacture these bleachers from the highest quality aluminum. All our 4-row aluminum bleachers are designed to sit on flat on a solid surface to maximize comfort and safety. We take pride in meeting all international building code requirements! Seating capacity for our 4-row bleachers ranges from 40-72 depending on the length needed when ordering. 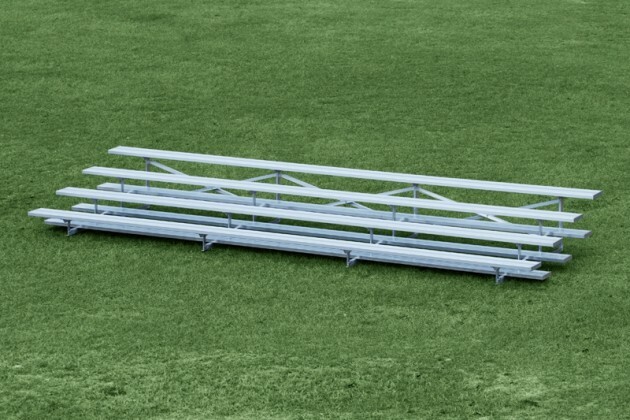 These bleachers are designed for safety, easy assembly, and durability. The all-aluminum framework is combined with aluminum anodized seat planks and mill finish foot planks. Standard widths are 15′, 21′ and 27′.